Fishing Norfork Lake has been a blast over the last week. 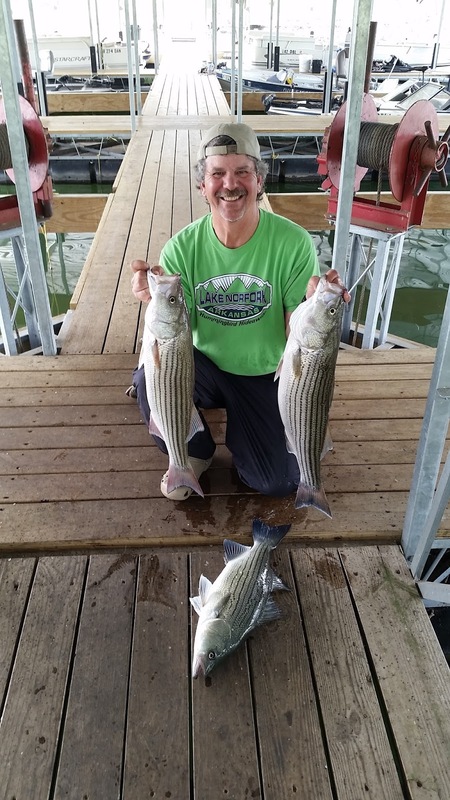 Striped bass, hybrid bass and white bass fishing has been very good. Fish are up tight on the banks before sunrise and they stick around until the sun gets above the tree line. On a cloudy day they stick around longer like they did this morning. This morning (5/16) fishing was awesome. I got into some of the best top water action I have seen in a week. I was fishing in a main lake area on the shallow side of the lake, not bluff line side. There are a lot of small cuts in the shoreline with points that have brush out in the water. At around 6AM I noticed a few fish coming up out in the main channel. I started to head out but heard splashing behind me and turned around to find the whole shore line and all the cuts were boiling with fish. Every cast with my Zara spook I either had several hits and misses or had a fish. This lasted until about 8AM. I landed over 20 fish and I caught myself giggling a few time. It was fun! Top water action for stripers and hybrids should last until the water temperature warms the lake enough to form a thermocline. Mother nature will have the final say on this. 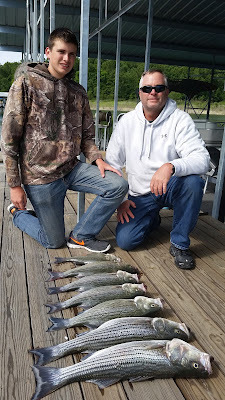 When the stripers leave the shallow water in the morning start looking out in deeper water and you should find them suspended down to about 30 - 40 feet deep. Live thread fin shad has been working the best for me with just a small split shot. Artificial baits that have also produced fish have been a Kastmaster spoon with buck tail and smaller sized swim baits 3 - 4 inches long. There has also been some good white bass top water action in the late afternoon. They could be anywhere from deep to shallow water, but the most consistent spots are part way back in some of the major creeks. 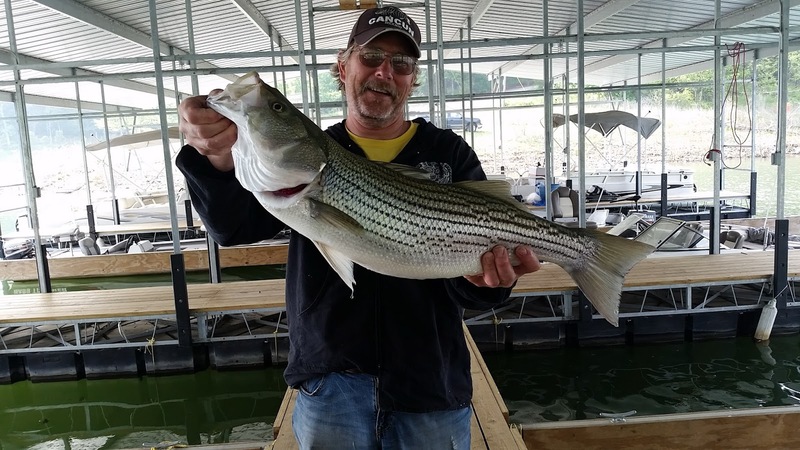 Largemouth and spotted bass fishing has also been very good. They have been in the same areas as the stripers early in the morning, but unlike the stripers, they don't necessarily move out once the sun comes up. 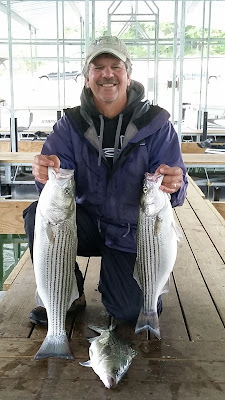 Swim baits, spinner baits on windy days and tube jigs are working well. They are moving to the bottom once the sun gets high in the sky so work a jig and pig or your favorite plastic bait along the bottom up to 25 feet down. Walleye fishing has been good. I have found some nice fish while striper fishing on shallow points down 15 - 25 feet. Anglers have also picked up a few on a Zara spook right on the shore line before sunrise. No change on pan fishing, both bluegill and crappie are biting. Look for the gills inside of bluff line cuts 20 - 30 feet deep on the bottom. Worms and wax worms are working great. Crappie are in or around brush and under docks. Small live thread fin shad is the best bait, but crappie minnows with a small jig is working as well. The Norfork Lake level is slowly falling and currently sits at 553.95. The lake surface water temperature is holding fairly stable and is ranging from 69 degrees to 71 degrees. The creeks and coves are stained and the main lake is clear on the surface. One generator has been running continuously.